We’d love your help. Let us know what’s wrong with this preview of Duplicity by Aleatha Romig. To ask other readers questions about Duplicity, please sign up. Just wondering... Why are people rating a book that hasn't been published and won't be for another 7 month at least? I mean, I'd understand if it were closer tot he release date and some had gotten an ARC, but I highly doubt this is the case... Not cool!!! The Tales from the Dark Side series continues! 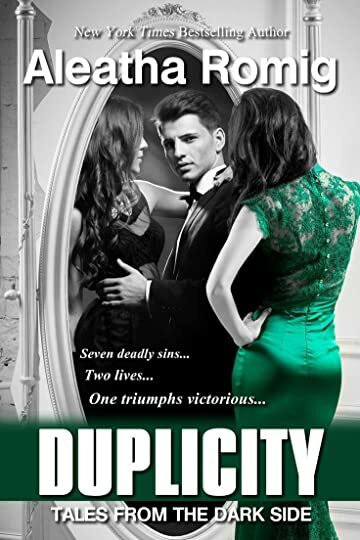 Here's the cover of book two, DUPLICITY!! This is a standalone romantic thriller and it will be released in September 2015. Blurb coming soon. Why are people rating it 1 and 2 stars ? The summary is not even out yet! It is with a heavy heart I also announce that Duplicity has been put on indefinite hold. Soooo, why am i having such a difficult time finding this book? Aleatha Romig is a New York Times, Wall Street Journal, and USA Today bestselling author who lives in Indiana. She grew up in Mishawaka, graduated from Indiana University, and is currently living south of Indianapolis. Aleatha has raised three children with her high school sweetheart and husband of over thirty years. Before she became a full-time author, she worked days as a dental hygienist and s Aleatha Romig is a New York Times, Wall Street Journal, and USA Today bestselling author who lives in Indiana. She grew up in Mishawaka, graduated from Indiana University, and is currently living south of Indianapolis. Aleatha has raised three children with her high school sweetheart and husband of over thirty years. Before she became a full-time author, she worked days as a dental hygienist and spent her nights writing. Now, when she's not imagining mind-blowing twists and turns, she likes to spend her time a with her family and friends. Her other pastimes include reading and creating heroes/anti-heroes who haunt your dreams! Aleatha released the first of her series TALES FROM THE DARK SIDE, INSIDIOUS, in the fall of 2014. These stand alone thrillers continue Aleatha's twisted style with an increase in heat. Aleatha entered the genre of romantic comedy with PLUS ONE. Her "Lighter Ones" are now standalone hits with many of her dark and new, light readers. Aleatha is a "Published Author's Network" member of the Romance Writers of America and a member of PEN America. She is represented by Kevin Lyon of the Marsal Lyon Literary Agency.